The pace at which new home security cameras are coming to market is making it increasingly difficult to say which model is the absolute best. Nest started shipping its Nest Cam Outdoor last week, and we’ve been putting our eval unit through its paces. Now Canary has announced a compelling new camera: The $199 Canary Flex can not only be used indoors or out, it also offers the option of operating solely on battery power for two to three months at a time (less if you’re streaming 24/7). Canary is best known for its namesake Canary home-security system. The company waged a wildly successful crowd-funding campaign—raising nearly $2 million against a $100,000 goal—to bring the cloud-connected security hub to market. 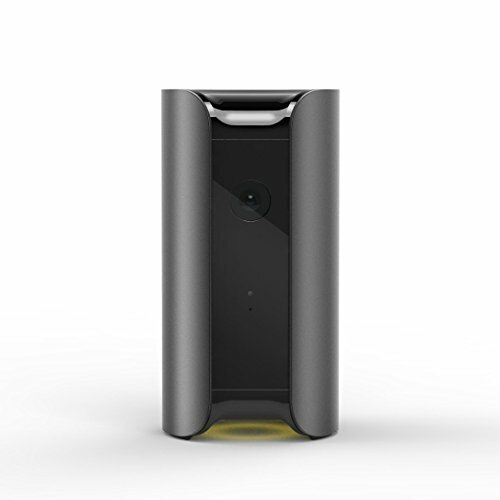 The original Canary houses a camera, microphone, siren, and an environmental sensor array. I generally liked the Canary when I reviewed it 2015, but I criticized it for its inability to connect with door/window and motion sensors as well as other smart-home systems, such as lighting and climate control. 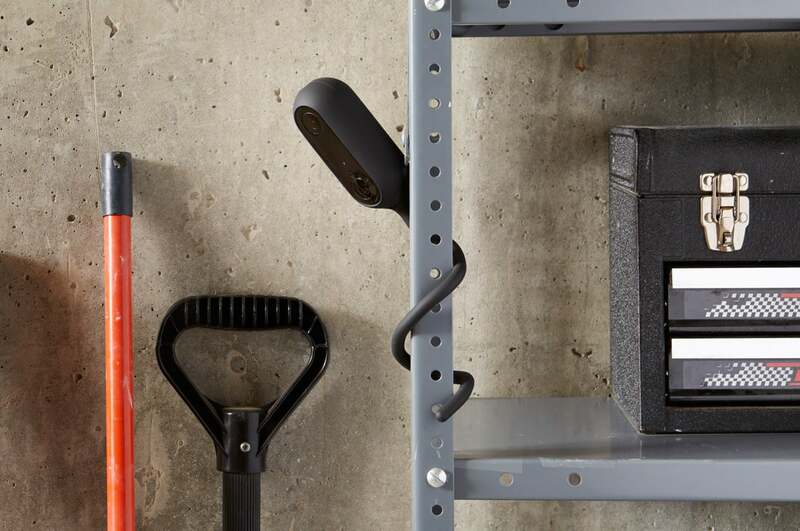 The Canary Flex won’t have those capabilities either, but this device is being pitched purely as a security camera, versus a security system. 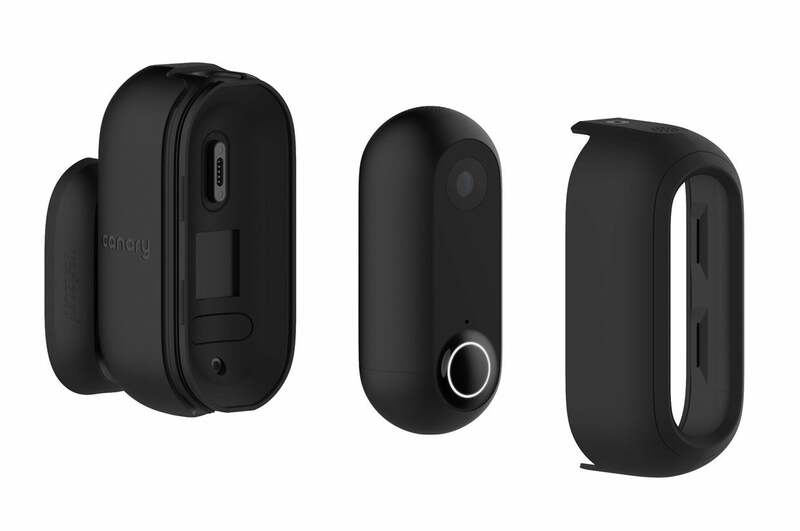 As such, it’s a somewhat simplified version of the original, with a weatherproof HD (720p) camera, a passive infrared motion sensor, LED night vision, a one-way microphone (two-way talk is a promised update), an onboard dual-band 802.11n Wi-Fi adapter, and the aforementioned rechargeable battery. The standard magnetic swivel mount allows you to point the camera, which is outfitted with a 116-degree wide-angle lens, anywhere on a 360-degree axis. 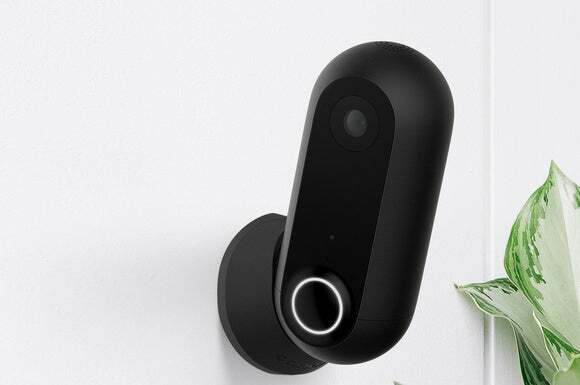 The camera mounts to a magnetic swivel base that allows it to pivot 360 degrees, similar to Netgear’s Arlo outdoor camera, but it’s somewhat larger than that device and offers the option of operating on AC power with its 8-foot cable. Like Netgear’s camera, the Canary Flex will spend most of its time asleep to preserve battery power, waking only when something moves in front of it, at which time it will record a video clip and upload it to the cloud over Wi-Fi. 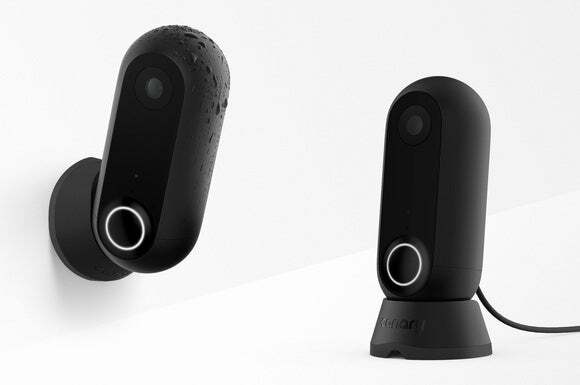 The Canary Flex can operate as a standalone camera, but it will be much more useful working in concert with other Canary devices—it will even be able to trigger the original Canary’s onboard siren. And while it doesn’t have its sibling’s suite of environmental sensors, there will be a number of optional accessories that could make it an even better security camera. The most interesting of these will be a 4G LTE mount, but that won’t be available at launch and we don’t know how much it will cost. Designed in collaboration with Verizon, the 4G LTE mount is a secondary weatherproof enclosure with a supplementary battery. It mates to the Canary Flex by way of its power adapter, enabling the camera to upload video from locations where Wi-Fi isn’t available. You’ll also be able to take it with you on the road. In this respect, it sounds a lot like the Panasonic Nubo, whose U.S. ship date has repeatedly slipped (it is available in Europe). Buyers will need to purchase this Canary accessory directly from Verizon, and Verizon will handle the billing. This optional weatherproof mount will enables the Canary Flex to stream video over Verizon’s LTE network, eliminating the need for Wi-Fi. Canary will offer three more conventional mounts for the Canary Flex: Just like it sounds, the $20 Stake Mount snaps to the camera and lets you plunge it into the soil in a flower bed or pot. The Twist Mount, also $20, is a flexible coil that can be wrapped around a tree limb, bannister, or deck railing. The $30 Secure Mount is the most conventional of the three, since it enables you to secure the camera to any flat surface. Canary says it will change its service plans starting in October, expanding its free plan to allow customers to view up to 24 hours of video history and download as much as they want with no data caps or restrictions. With the current free plan, you’re limited to a 12-hour window, and you can download only three video clips per month. With the new paid service—$10 per month for one device, $15 for two or three devices, and $5 per month for each additional unit beyond that—you’ll be able to access the last 30 days of recorded video, also with no limits on sharing or downloads. Under the old plan, that level of service cost $299 per year (Nest also charges $300 per year for access to 30 days of video history, plus certain other services). With the optional twist mount, you can deploy a Canary Flex almost anywhere. In addition to the viewing windows and downloads, Membership subscribers will be entitled to three other benefits: If you suffer a burglary, Canary will provide a dedicated agent to help you evaluate damages, retrieve video evidence, and provide other services. The company will also reimburse up to $1000 of your homeowner or renter insurance deductible. As a final benefit, Canary will extend the warranty on your Canary products to two years from their original date of purchase (the standard limited warranty runs for one year). We all hate subscription plans, but that sounds like a lot of value for the money. And the Canary Flex—especially with that 4G LTE mount—sounds like a very compelling product. We can’t wait to get our hands on one. The Canary is available for pre-order now.